Bok Nal is Today! Please email Korean Parliament Now! Please send an email to the list provided. You can just copy and paste the whole list and send the whole lot in one go. Sample letter below. Please attach some photos of the torture to your emails, if you know how. You can just paste in this link, or download some of the torture photos from the Food Torture page, and email them with them letter. The Bok Days Festival in South Korea runs from July and August each summer. Last year there were cases of dogs and cats being burnt alive and boiled alive. This ancient torture of animals does not belong in a state within the United Nations Country. UN Secretary General Ban Ki Moon, who is also a Korean, speaks of civil society and a culture of peace. We ask the Korean Parliamentary League on Children, Population and Environment to make illegal the torture and boiling alive of dogs and cats, and any other animal. Last year at the Bok Days Festival, children were sold toy dogs, with knives and sticks attached – so they could practice torture of dogs…. Please end dog and cat meat trade, because the business is based in torture. Dogs and cats are sentient beings and should not be eaten. Some Korean children are still being taught that dogs are bad, and deserving of torture. Please end this ancient culture of hate. Some Korean families buy a dog or cat from the market, take it home, torture it and boil it alive. Please stop this disgrace. Groups of young men beat and torture dogs because they believe they will gain sexual process by eating tortured dogs. Previous NoToDogMeat Protest Bok Nal at LA Korean Consulate Rally last Friday! 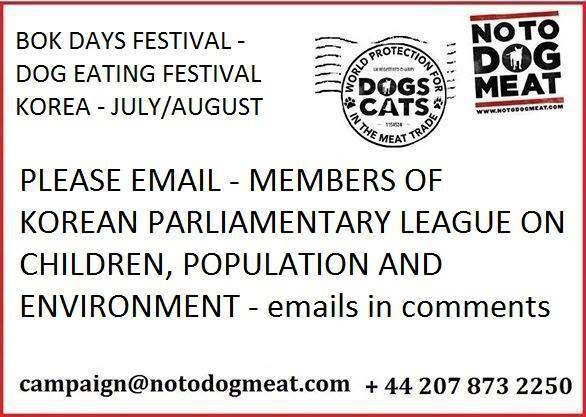 Next Walk a NoToDogMeat London Mile, Oxford Street this Saturday! FYI, not sure which or maybe all of the email addresses fail. I received a message from my server advises the message failed. Yes I had one too I think it’s just one of them. It is because of the overflow of emails. A good sign. Stop this now! It is simply wrong. This has to stop now it’s pure evil! Let’s hope someone listens and can influence people to stop this practice. Please stop the meat trade of cats and dogs. Foreigners have downgraded the reputation of your country. For Gods sake! You’re pure barbaric cruelty is horrific! No excuse and no tolerance for this sociopathic behavior! This is completely inhumane! Contrary to their belief the meat does NOT taste better after being tortured! Dog is man’s best friend, they need love like we do not this kind of treatment! Please stop this NOW!!! Small farmers have a spiritual role in veganism as well. The vegan diet itself is a spiritual movement because it is the single most effective way to expand our human compassion and noble quality, and loving quality. It can reverse the cycle of violence and bad karmic retribution: “As we sow, so shall we reap.” And it places us within a circle of love, protection and mercy from any negative happenings in the physical realm.